Times of San Diego completed its first month with 23,267 online readers, over 60% of whom were in the 18-34 age range desired by online advertisers. The cumulative traffic for March 13 through April 12 is higher than forecast, and the site is on track to reach more than 50,000 readers in its second month. “The Times of San Diego is off to a promising start, with a strong first month. It has especially good numbers for elusive younger readers in San Diego, who are under-served in this market,” said Peter Krasilovsky, a respected online analyst with the BIA/Kelsey group. 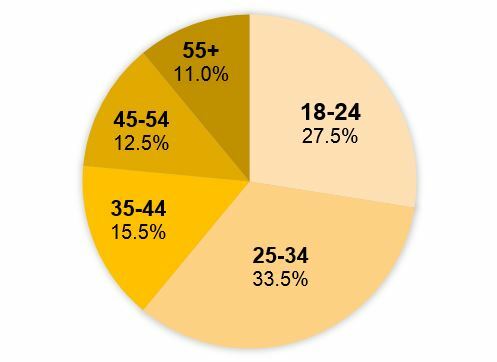 Readers of Times of San Diego are considerably younger than for traditional media, with 61% in the 18-34 age range and over 76% in the 18-44 range. Most of the readership in the first month was local and regional, including 35% from the City of San Diego, 18% from other cities and communities in San Diego County, and 9% from elsewhere in Southern California. As is true of most online news sites, the remaining 38% of readership was national and even international, thanks to indexing by Google, Bing and other search engines. The readership is very mobile, with 32% on smartphones, 10% on tablets and the remainder on standard computers. Times of San Diego uses responsive design so that the site can be viewed equally well on any device. The site’s data on readers and their demographics comes from Google Analytics, which is a worldwide standard for measuring online traffic. Readers are “unique visitors” in Internet parlance, meaning someone who visited the site at least once during the first month. The readership data is based on visits, with many readers coming to the site multiple times.